Fine Art students at The Sixth Form College, Solihull are getting the opportunity to work with a real design agency this term. First year A level Fine Art students were given a live brief to complete a project with Design Studio Ensell & Hall. John Hall, co-founder and director of the company and an exhibition officer at Birmingham City University, visited the College to talk to the students about the work his firm does. 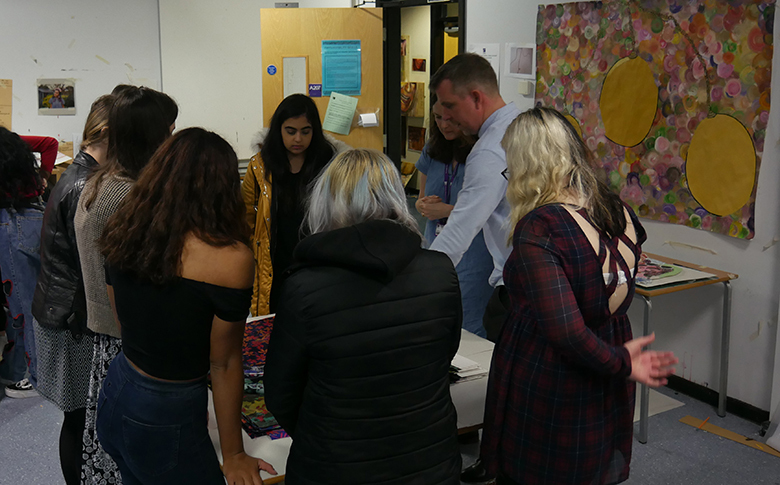 Ensell & Hall’s work is largely with the fashion industry and the students have been tasked with coming up with a repeat design for fabric to be used in fashion. The projects that students will be completing will be done over a four-week period. They have a choice of three themes and will be asked to produce a design to that theme, which can be reproduced using Photoshop. Their choices are Watery Flowers, Leaves and Butterflies, Abstract Botanicals and a Now You See Me camouflage theme. They must come up with a design that can be used as a repeat design across a larger piece of fabric. John Hall gave the students some practical tips on the techniques to create a repeat pattern. The students’ project ideas will be judged by John Hall at the end of the four-week duration of the project. Prizes will be handed out and if any of the work is judged good enough, students could find their work reproduced and put up for sale. Ensell & Hall’s clients include Marks & Spencer, H&M and Next.